I met Eamonn Dowd good fourteen years ago on a rainy day in Dublin at the Ha’Penny Bridge Inn. Even back then it was hard to ignore the “coolness” around him when he walked into the pub. Eamonn is one of those solders of the music that has been here a long time. He never really fitted the mould of what would work with the major labels, so they probably just wished he would eventually go away. But as much as Eamonn could not give a damn about what the major labels thought, he was not going to go away. What Eamonn Dowd had and still has whether he is solo or with one of his bands, is timeless true rock n’ roll charm, mixed with a touch of outlaw country. These days Eamonn is based in Gothenburg, in Sweden, when he is not on the road. He churns out albums and EP’s at his own pace, to the demand of his loyal fans. 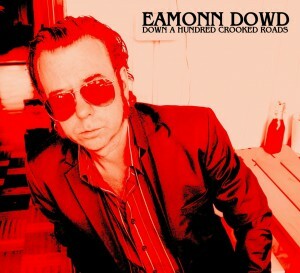 Eamonn’s latest instalment is a solid rock n’ roll album “Down a hundred crooked roads”. This is an intense album, nine songs in just 23 minutes which proves how albums are not made for their length, but their content. From the first two tracks of the album “Five Star Soul” and “She Went Out Gallivanting” you feel like you are at a live show. Raunchy electric guitar and a straight forward beat, is like a freight train chucking along. Eamonn is a crafter when it comes to song writing. Songs like “Fiery Frank” are the kind of songs that showcases his storytelling abilities and the regular readers of my blog know I rate that highly in songwriters. But there are songs like “Lonesome Street” and “River’ Frozen til April” (duet with Ingrid Veernman) where the rock n’ roll machine changes gears and along side Eamonn’s electric he show’s us he is no stranger to acoustic guitar either. There is something brilliantly refreshing about the album in these days when even country music is turning into overly polished production line products. Eamonn stands true to the songs and the raw sound of rock n’ roll.